Storyasking Templates & Workflows: Some Structure | Magister P.
If you want a real simple story, this is it! A classic TPRS story has 3 locations because the main character can’t resolve their problem. TPRS is designed really well, exposing students to repetitions of the frequent vocabulary in such an engaging way that the repetition isn’t obvious, or at least seen as a burden. The no-travel script is a faster version, smaller in scope (e.g. just 25 unique words for the Latin version). Looking for similar repetition of classic TPRS? Just ask more questions during the storyasking process. Print the second page of this workflow and use it during class to help guide you (and students) along. type up, edit, and add details/dialogue, cognates, etc. **If students are still being sticks in the mud** keep focusing on being comprehensible, and ask them either/or questions based on what YOU see in the cubes. Today, one class either had nothing come to mind, or their ideas were too extravagant/complex for what we could understand in Latin. Reign in those elaborate ideas using the cubes to ask an either/or. Maaaaybe, they’ll reject YOUR story ideas and begin participating more. It’s magic! The best input-based strategies & activities get us more mileage out of a single product. Here’s a way to expose students to other class stories, as well as get parallel stories for those very classes! I applied the idea of completing OWI character profiles using other classes’ drawings to the Story Cubes rolled for the stories. in groups, students brainstorm (set a short timer in order to keep English at a minimum) to determine the other class’ story based on the pics of the cubes. Lead a reconstruction of the other class story in the target language using a blank graphic organizer. Finish with revealing the actual story after the whole-class discussion. Use your favorite reading strategy! So, if there are 4 groups of students, you now have 4 different interpretations of the other class’ Story Cube story. Type THOSE up, then read with the other class, and/or compile for the Free Voluntary Reading (FVR) shelf. I enjoy using OWI’s from one class as an anchor for a warm up story in a different class. 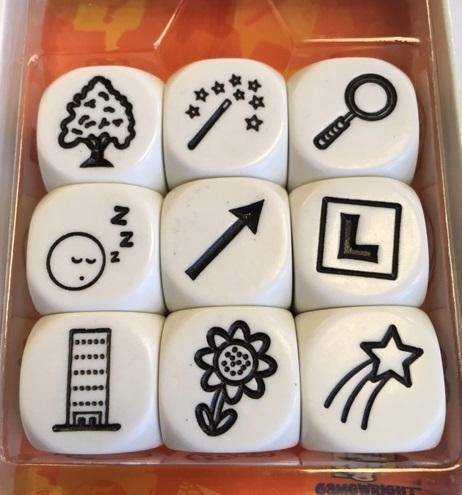 I think it would work well – with even more room for interpretation – using the story cubes. I like the idea of writing up all the versions for the FVR library. Thanks for sharing.